October 6, 2017 By Chelsey 2 Comments This post may contain affiliate links. Read my disclosure policy here. Is your daughter crazy about princesses? Does she want a Princess birthday party theme? I had these pretty princesses sitting on the counter when my nine and eleven year old girls got home from school and immediately went crazy over them. “Mom, these are so cute!” “Mom, what are they for?” “Can I have Rapunzel and Anna?” But I couldn’t blame them because when I bought them I only went to get three little dolls and came back with seven of these adorable figures. These princess cupcakes were so easy and super fun to make. With a little training, even my girls could make them. I coordinated the cupcake liner with the princess that best fit the color. Then, baked two of each of those colors (in case I messed up). Fill the same as you would a paper liner. Bake according to the directions on your cake mix box. While the princess cupcakes were baking, I mixed up all the colors I needed for the princess dresses. I never buy the actual frosting bags anymore. It is cheaper and just as easy to use the quart size ziplock bags. I cut a small corner off the corner of the bag and push the large piece of the coupler into the hole. Then choose a tip for the end and put on the tip of the bag from the outside. I stick the tip in head first into a large cup and fold over the top of the bag. This allows for easy and clean filling of the bag. Shake frosting to the bottom and push out the extra air from the top. then twist and tie the end with an elastic band. I use my daughters tiny colorful elastic for her hair. They work great. I cut off extra bag pieces that might get in the way. Then screw on the ring to hold it in place. I played around with the different looks of each tip until I found the style I liked for each dress. I used a variety of tips trying to make each dress unique and fitting for the different princess. This is up to you and your own creativity. Have fun with it! I am definitely going to involve my girls the next time I make them. 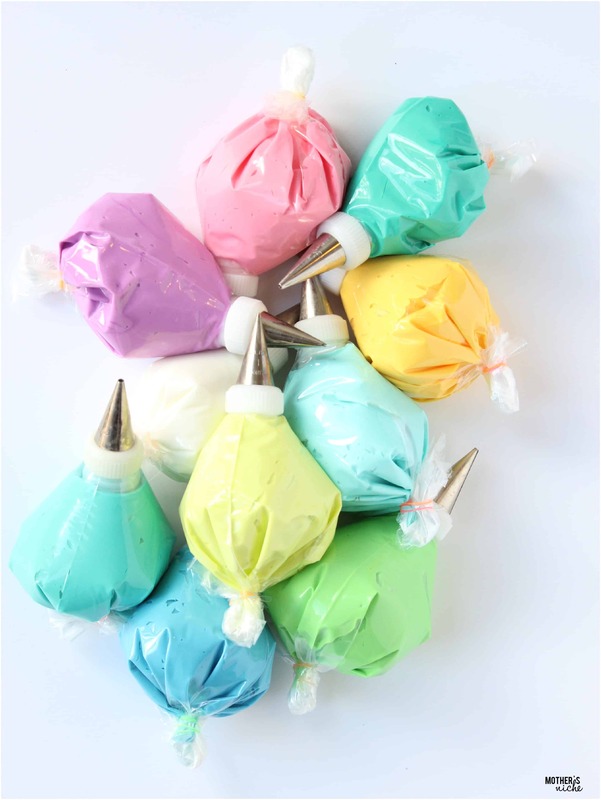 They will love a cupcake decorating lesson. In the meantime my girls love playing with our new little princess dolls. The princess cupcakes looked amazing displayed in a ferris wheel. You can find this adorable Ferris Wheel here! 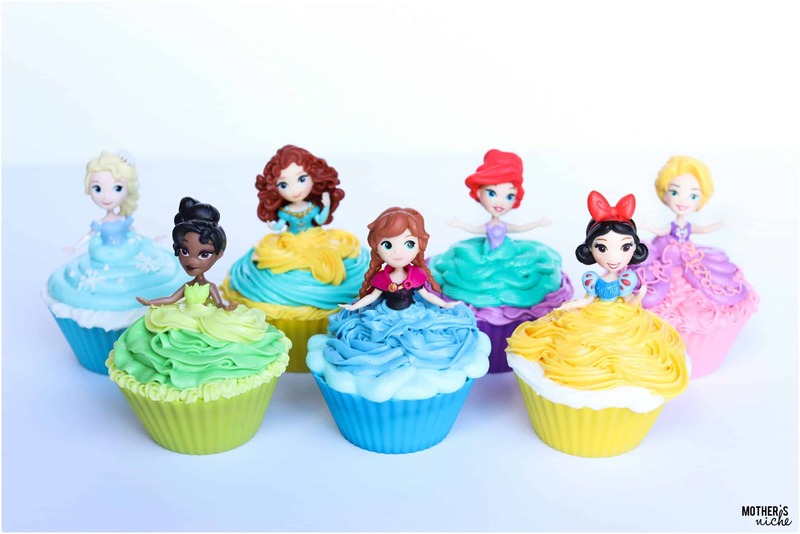 You can also use Cupcake carriages for each Disney princess, which would be equally adorable. 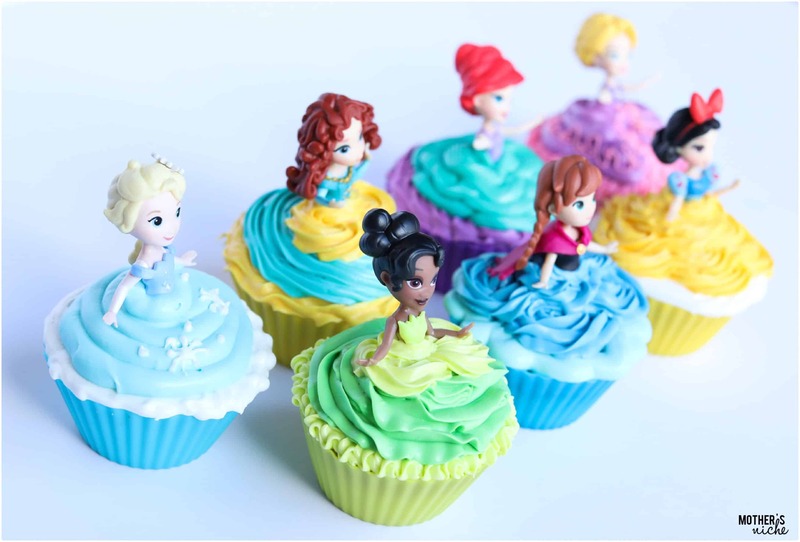 If your child really wants an actual birthday cake, you can easily use the princess cupcakes as part of the cake. A good idea might be to make a round cake, and top with a castle cake topper. Once the princess castle cake is created, place the princess cupcakes around the cake. Super cute! 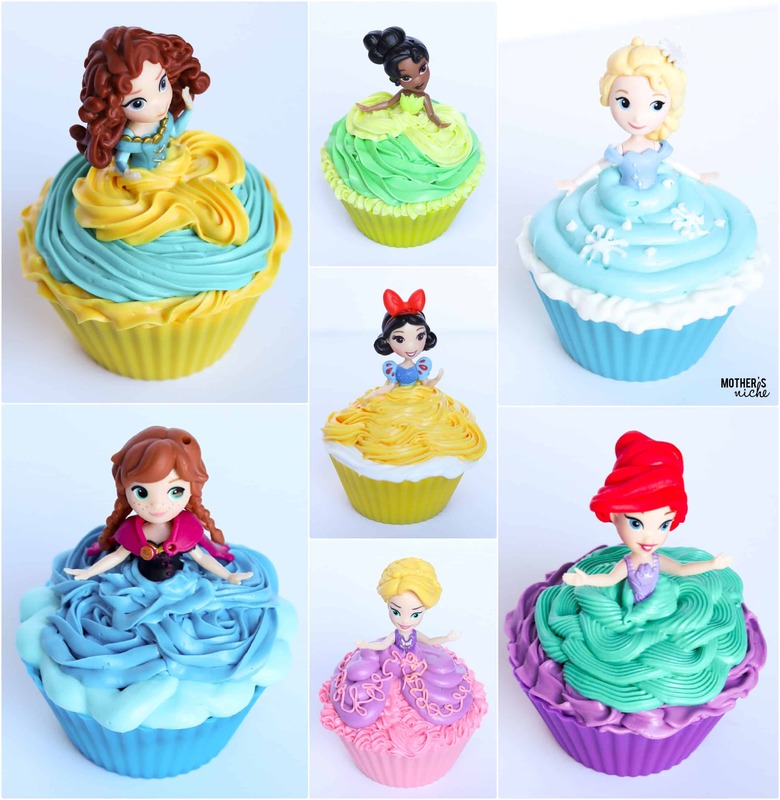 Which is YOUR favorite Disney Princess Cupcake? So adorable! Any little girl would love these!